Although all the best formations are concentrated around the Utah-Arizona border either side of US 163, Monument Valley extends many miles to the northwest, where the land slopes gently to the shores of the San Juan arm of Lake Powell. The views here are of desert plains between isolated buttes and cliffs, with very few signs of habitation, and almost no other visitors. There is only one route across this area - Piute Farms Road, which once led to a Navajo-run marina but has become little used since this was destroyed by flooding in 1989. 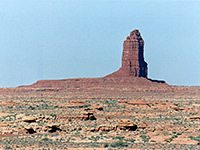 This northern section of Monument Valley is reached by continuing past Goulding on the paved but rather bumpy Oljeto Road, which is quite well traveled, by the Navajo rather than tourists since it gives access to various settlements scattered over the red desert to the north, all in the shadow of 5 mile long Oljeto Mesa which runs along the left side of the road. At the northern tip of the mesa, the main route curves back south and ends at the small village of Oljeto, another historic trading post. Also at the north end of the mesa, after a big butte on the right (Train Rock) and a larger cluster of houses just beyond, a side track branches off, crossing a wide wash and heading into deserted lands to the north, now with very few signs of habitation. This is Piute Farms Road, which follows close to Piute Farms Wash for 16 miles to the San Juan River - once part of Lake Powell but its waters have long since receded several miles to the west. 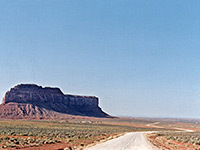 The track climbs up the hillside opposite Oljeto Mesa, passes over a ridge then enters wide open plains, bordered by high red cliffs on the left, and a few isolated buttes interrupting otherwise flat land to the right. A few side tracks lead to distant houses and hogans but most is quite empty. The road descends gradually towards the jagged cliffs that surround the San Juan River canyon, and forks after 8 miles; both branches become narrow and a little rougher. The right (main) fork leads to the river, though the last part may require 4WD. 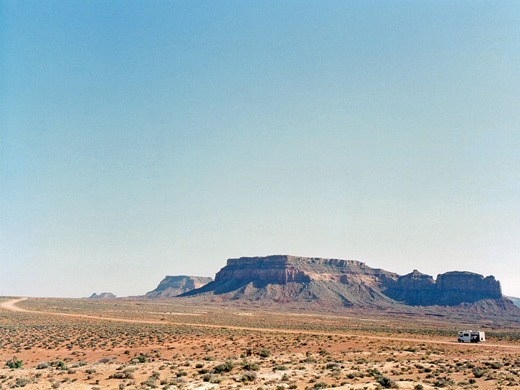 This is a remote-feeling place, very different to the busy Monument Valley center just 10 miles away. Primitive camping should be possible anywhere along the road, as long as a Navajo permit has been obtained.